Drone Wars UK understands that the Ministry of Defence (MoD) will announce on Monday (24 Feb) that live training flights of the Watchkeeper drone will begin over Salisbury Plain in Wiltshire. 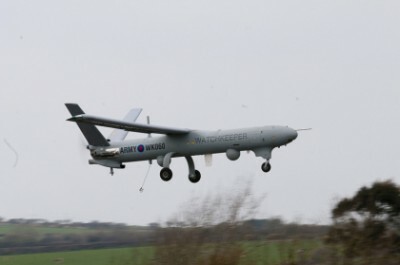 The Watchkeeper drone has been developed under a £900m MoD contract by U-TacS, a joint-venture company owned by Thales UK and Israeli company Elbit Systems. Watchkeeper has now gained certification from the Military Aviation Authority – who said that the drone has met “an acceptable level for design safety and integrity” – and has been given an interim release to service, which will allow army crews to begin training flights. It should be noted that while Reaper drones are flown by RAF pilots with previous experience of flying, the Watchkeeper is operated by the army and flown by members of the Royal Artillery. While the Watchkeepers have undergone test flights at Parc Aberporth in West Wales in completely segregated airspace, the training flights will now begin from Boscombe Down airfield, an area used by piloted aircraft before flying into segregated airspace over Salisbury Plain. This is the first time that the larger type of unmanned drones will have been regularly flown in UK airspace alongside ‘manned’ aircraft and substantially increases the danger of a crash involving drones. Drones crash much more than piloted aircraft and we have recorded more than 70 crashes of the larger type of drones in the past three years alone. In October 2010 there were two near-misses involving smaller drones and military helicopters at Salisbury Plain in one day. According to the BBC, the official UK Airprox Board report into one of the near misses involving a small Desert Hawk drone and an Apache helicopter said they “were on a collision course” and there was “a very high risk of a crash”. Besides the increased chance of a drone crash, the people of Wiltshire can also expect a lot of noise from the Watchkeeper. Local residents living near to where the Watchkeeper is being tested in west Wales regularly complain about the disturbing noise which they describe as like a loud flying lawnmower. Perhaps most disturbingly however local residents may be targeted by the drones during the Watchkeeper test flights. In 2012 it was revealed that drone pilots in the US train by tracking and trailing vehicles driving along local highways. Who knows, it may well be that in the near future people driving along the A36 or the A303 near Salisbury Plain will, unknown to them, be followed by a Watchkeeper drone as part of a training exercise. Below is an MoD presentation on Watchkeeper obtained by Drone Wars UK in 2011 following a FoI request.